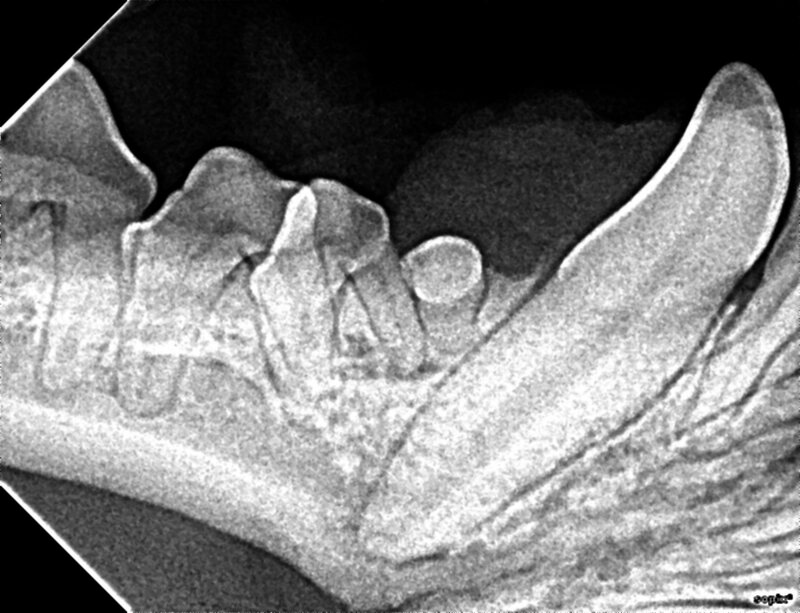 As a general, small animal practice without a boarded veterinary dentist, ours holds a strong belief in the importance of routine dental care and the need for home care by the owners. These wonderful owners own a Pug. She is five years old and she came in today for her third dentistry. 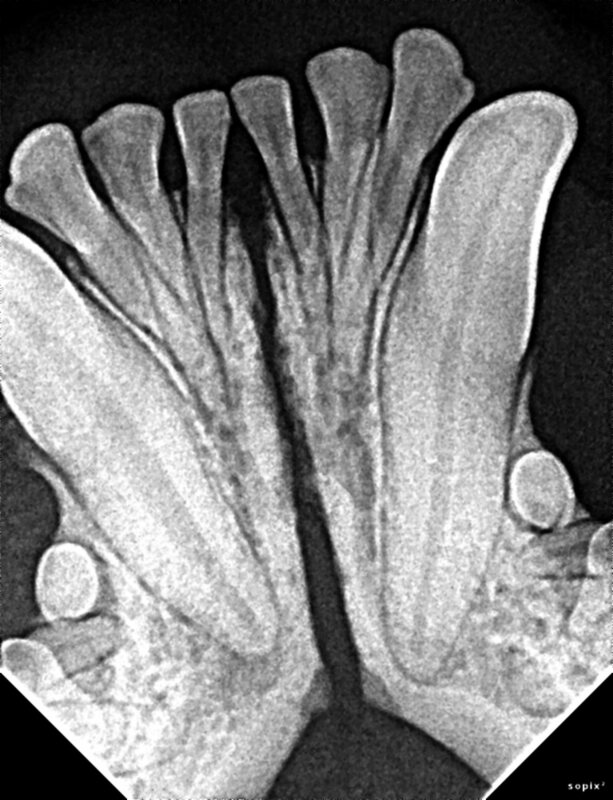 Our expectation of today’s dentistry was that there was little to no tartar, no obvious gingival pathology, and we were following a discolored tooth radiographically. 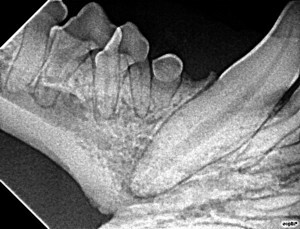 The first radiograph was from 2012 when the discolored right lower canine was first noted. 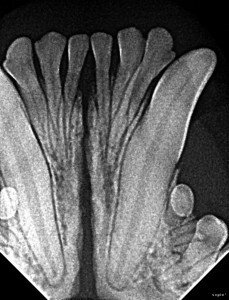 The right lower canine shows a widened root canal and a hint at some periapical changes. We recommended that the client pursue referral with one of our area dental diplomates but the clients opted to watch it. We recommended they return in 3 months for a follow up radiograph. Although they did not return in 3 months, they did return in one year. Now you can notice that the root canal of the left lower canine is narrowing , as it should as the dog ages. 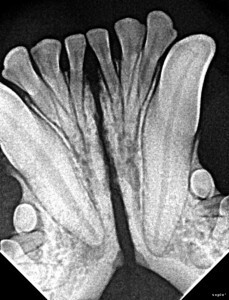 The left side is still wide (non-vital) with definite bony changes periapically and the root appears shorter than the opposite tooth. Again, referral was recommended and they opted to return in 3 months for a follow up X-ray. As it does with all of us, time flew quicker than they realized, but they returned in 1 year for their annual dental care. 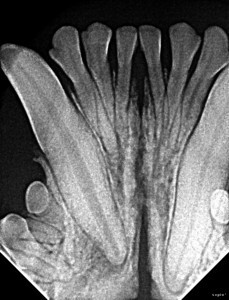 You can definitely appreciate the appropriate narrowing of the root canal in the left lower canine. The non-vital tooth on the right side still has a wide canal, the tooth appears to be on the run and there is evidence of a periapical lucency. The recommendation was for referral for evaluation by a board certified veterinary dentist. They are going to take their baby now. I did not share this case to judge the owner’s decisions regarding their pet. I shared these radiographs to illustrate that discolored teeth do change over time and to highlight the value of regular cleanings and radiographic follow-up. I wish I had taken a photo of this pet’s teeth. There was little to no tartar, yet they understood the importance of regular care.